Designed to meet the needs of workers performing mission-critical tasks in transportation, logistics and field service, the CN3 mobile computer delivers a powerful combination of communications technologies in a compact, rugged package. With standard WiFi, Bluetooth and choice of integrated, network independent GPS receiver and WAN voice and data services (including 3G EV-DO or EDGE), the CN3 enables companies to stay connected with their mobile workforce in real time, driving improved efficiencies and increased asset visibility across their operations. With mobile intelligence at their fingertips, companies can increase customer responsiveness while also reducing inventory and transportation costs. Built to survive the rigors of the road, the CN3 meets rugged, standards-based environmental specifications and provides features that meet the needs of mobile workers. The CN3's 1.3 megapixel color camera provides a vital data validation tool, enabling workers to document proof-ofservice or vehicle inspection. 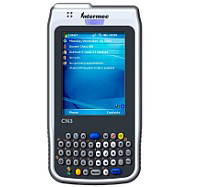 The CN3 has 128 MB RAM and is available with an ultraslim extended battery that delivers easy-tocarry, all-day power.